Bienvenue au printemps 2019! Temps parfait pour se faufiler et profiter de la détente et profiter de tout ce que Branson a à offrir. Notre cabine dort 4 et a le nouveau matelas et la base de roi de qualité et un dormeur de taille normale. Il est conçu pour cette escapade personnelle et confortable principalement. Si nous avons réservé, nous avons une autre propriété dans le centre-ville de Branson - consultez le VRBO # 1442058! Nous offrons une connexion Wi-Fi gratuite et une écoute familiale sur plusieurs chaînes câblées. Nous sommes juste à côté du Strip et à côté du Tanger Outlet Mall et à quelques pas de nombreux spectacles et attractions. Dans les cabines, vous aurez l'impression d'être dans un autre monde. Cette suite lune de miel est la plus belle maison en rondins! Il a plus de 700 pieds carrés d'espace de vie et est situé au cœur de Branson, juste à côté de 76 et niché dans les bois surplombant un petit ruisseau qui coule juste à l'extérieur de la terrasse couverte arrière. Nous voyons même des cerfs de retour là-bas. Vous apprécierez le sentiment d'être dans les bois tout en étant à distance de marche des attractions et des boutiques de Branson. La cabine est de plain-pied, entrée de plain-pied et dispose de plafonds voûtés et poutres apparentes. Caractéristiques de la cabine, bain à remous, TV LED 40 pouces, lecteur DVD et WiFi. La salle de bain principale est équipée de doubles douches de pluie. La cuisine entièrement équipée comprend de nouveaux appareils avec un grand réfrigérateur avec machine à glaçons, une cuisinière lisse, un four à micro-ondes et un lave-vaisselle. La salle à manger pour 4 et terrasse privée couverte a une table pour 2 pour profiter d'un temps privé en plein air. Le salon a une belle pierre, foyer au gaz, une télévision à écran plat LCD. Nous avons WiFi gratuit dans tout l'unité. En outre, cette unité comprend une laveuse et une sécheuse à chargement frontal ET la cuisine est entièrement équipée pour vos besoins de cuisine ainsi que de nombreux restaurants sont à un jet de pierre! DIRECTIONS, note- assurez-vous d'accéder à partir de WildWood pas Rosalee - la porte à Rosalee est fermée. Les animaux domestiques ne sont pas autorisés seulement les animaux de service et il n'y a pas d'accès à la piscine du quartier. Nous avons une autre propriété dans le centre-ville de Branson - consultez le VRBO # 1442058! Besoin d'une cabine supplémentaire? Cabine adjacente est # 817370 & une autre cabine à quelques jetons est # 817352. Si vous avez besoin d'un handicap, regardez VRBO # 846568. We had a wonderful time. Loved the atmosphere of the design. Will definitely book this property again!! My daughter & I came to the Praisefest for 2 nights had a great time the cabin was nice the bed comfortable, nice big shower needed a little more water pressure the towels were so plush & pretty ! Glad they had a keurig for our coffee! Found popcorn on the floor & red glitter & trash can was dirty with coffee grounds in the bottom could use a better cleaning after all we pay for that!! It’s a cute cabin & would like to come back!! The stream behind the cabin was nice to listen too! So close to the Tanger Outlet we had fun shopping & finding deals! Perfect little cabin for a getaway. All that we needed was provided. My only suggestion is that the hot water could be hotter. Happy to hear you enjoyed your stay. We have recently installed a new larger capacity water heater and have had the plumber adjust the heat setting. Come back and see us! We had a wonderful trip to Branson and enjoyed a kid free weekend. The cabin was perfect. We loved the location of the cabin. Close to town yet very quiet. 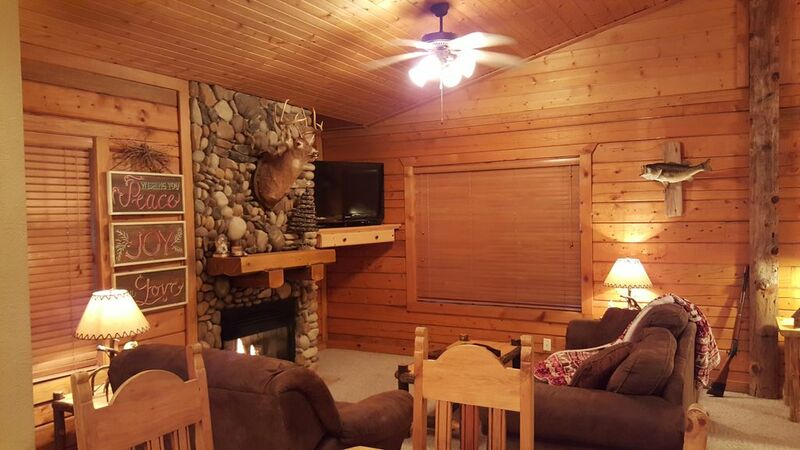 The cabin was exactly as described and the owners were easy to work with. We never could get the TV or fireplace to work but neither was a huge deal for us. Our only complaint would be the towels smelled really bad. Remotes!! Yes, there are two of them and sometimes a guest will push a button that makes it difficult for others to use - next time just ring us and Kay will walk you through what to do. We have let our cleaning crew know about the towels and they are making sure this doesn't happen again. Come back and see us soon! We loved our trip to Branson as usual but the cabin left a lot to be desired. Initially it looked nice and the fireplace was very nice but the oversized tub in the middle of the room was very much in the way. We were not there 20 minutes when my wife tripped over the step around the tub and nearly broke her arm. Ended up only a small cut to her forearm but I feel there should have been something marking the step. The next problem was that only half the lights were working and none on the front porch. Again not a huge deal by itself but again a safety problem. The biggest issue I found was the mold at the base of the shower. The wall at each corner had been wet several times and the leaking shower has caused it to develop mold. Again, another issue was the fact that the owner had not been there in over 2 months to take down the Christmas decorations. Also expect at the end of your stay to do some cleaning to be able to get your deposit back. You are expected to take out the trash, wash all dishes and strip the bed and place in the laundry room. No one had done anything to keep up with anything except their money. Needless to say I will definitely return to Branson but never stay at this place again. However, several items need to be addressed regarding this review. Nice part about being local is we let our guests know some of our local favorites and ask them to reach out if they need anything and we are prompt to respond! Excellent location near all the main attractions. Very nice cabin. 1 issue, low volume of hot H2O. Great location, very nice accommodations. Very comfortable as well, especially with the gas fireplace. Had some issues with the TV and low volume of hot water, but everything else was excellent! Drew, thank you for feedback. Water heater is a 60 gallon and less than 1 year old. Plumber is on their way right now to see what the problem is It was purchased to supply more than enough hot water for our cabin. On your next stay with us if there are any issues please let us know asap so we can correct immediately.